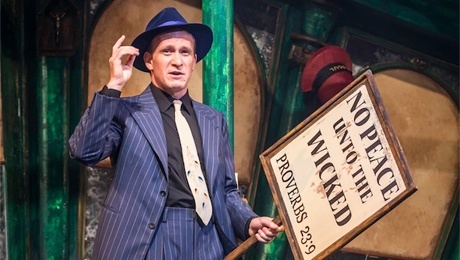 It is a sound idea that has seen Chichester Festival Theatre send their acclaimed 2014 production of Guys and Dolls on the road. The UK tour that commenced in Manchester in November last year is now making a 3 month stop at London's Savoy and it proves fun to re-visit some of this productions more inspired moments. Guys and Dolls is long acknowledged as one of the Broadway greats (Kenneth Tynan famously commented that along with Death Of A Salesman, the musical was the finest example of American literature) the Savoy show throws into relief how well the show works as a study of love and the human condition. But a cautionary tale. Its cute 1940's New York patter can easily become dated and too many of the show's gags need a punchy comic delivery that not all of this company are up to. Staying with the production from Chichester's original cast, Jamie Parker's Sky Masterson is up there with the best. His Sky has the gorgeous insouciance that the gambler demands, yet as he realises that he's never been in love before meeting Sarah, Parker reveals the cutest vulnerability too. And boy can he sing. Parker must surely rank amongst the best of his generation in acting through song. The other gem amongst the show's four leading roles is Sophie Thompson's Miss Adelaide. Barely clad in more mink than a mink, Thompson milks Loesser's wry Manhattan wit with spot-on timing, earning our chuckling sympathy for this most long-term of fiancées. 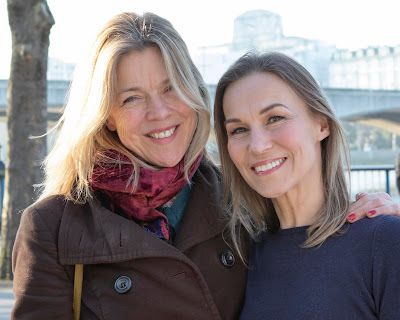 This reviewer is missing Clare Foster too – Siubhan Harrison makes a decent stab at Sarah Brown, but doesn't quite rise to the role's tough challenge. The dance work however is spectacular. Andrew Wright with Carlos Acosta has created some gorgeous routines - and with imaginative Runyonland and Cuba numbers, along with some sensational sewer-dance in the Crapshooters' Ballet the show's choreography is surely amongst the best musical theatre footwork in town right now. And the Hot Box Girls are gorgeously wonderful! The scenery (marquee lights and advertising hoardings that again suggest a nod to the National's 1982 ground-breaker) is more lightweight than lavish - though remember that this show is on tour so portable sets rather than a full blown West End set of trucks is to be expected. If you love the show, or just simply adore imaginative dance work then it's well worth a trip to the Savoy. If Sonia Friedman is reading this review here's my suggestion for a Guys and Dolls dream cast that is probably best staged within the next five years. Jamie Parker needs to stay as Sky - he won't be bettered. But Parker, a former History Boy, needs to be re-united with his classmate James Corden as Nathan Detroit. Lob in Sheridan Smith as Miss Adelaide and with either Clare Foster or Laura Pitt-Pulford as Sarah Brown and I believe there'd be platinum fol-de-rol for Friedman.